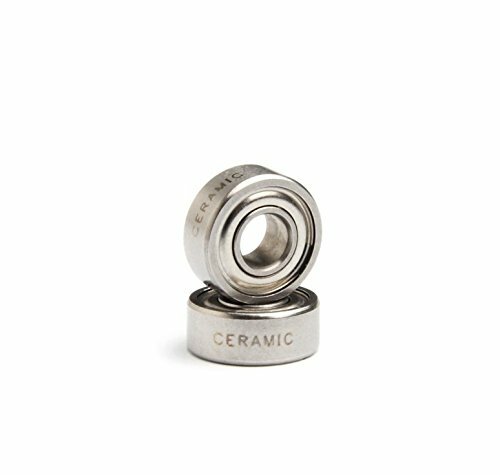 Ceramic bearings were originally manufactured for use in dental drills running at continuous speeds of 450,000-500,000 rpm! The use of the ceramic balls being because they are not affected by any heat caused by friction, & neither contract or expand. The material that the ceramic balls in Rocket Bearings are made of is Silicon Nitride which apart from diamonds is the second hardest material known to man! There are 3 other cheaper materials that are available for this application, but we only use the best. Similarly, please be aware that when buying bearings the ABEC rating is only to be used as a guide as ABEC and ISO standards do not cover: radial play, raceway curvature, surface finish, material, ball complement, number, size or precision level, retainer type, lubrication, torque, cleanliness at assembly, packaging and other factors that may be essential to the desired bearing performance. Manufactured to our precise specifications Rocket Bearings carry the International ABEC 7 rating, are manufactured DRY, are manufactured DRY, are stamped on the outside of the cage & are inspected to the German ISO9001 TUV Rheinland Certification.The Rocket Reel Company’s range of Ceramic Multiplier and Baitcaster Bearings are the world’s best Fishing Reel Bearings. Hybrid Ceramic bearings to be used in ABU reels. Each pack consists of 2 hybrid ceramic bearings. Quietly & without making any undue “song & dance” about it, our Rocket bearings have been slowly taking over the world of Tournament Casting & long range fishing. Manufactured to our precise specifications Rocket Bearings carry the International ABEC 7 rating, are manufactured DRY, are manufactured DRY, are stamped on the outside of the cage & are inspected to the German ISO9001 TUV Rheinland Certification.